There is one trading day left in the year and thus one last day for last-minute tax planning. More than any year in living memory, this one is unsettled simply because no one knows what the tax code will look like for either corporations or individuals next year. As a consequence, I have found that taxes have dominated my thoughts about investing for the last couple of weeks and that makes me uncomfortable, since some of the least sensible investment choices I have made in my lifetime have come about when tax considerations have been preeminent. To ground my thinking and actions for these last few weeks, there are three propositions about taxes that I have had to remind myself about repeatedly over the period. If you hold pre-tax returns constant, your objectives when it comes to taxes are simple: you want to pay less taxes rather than more, and later rather than sooner, and that is precisely what most tax advantaged investments offer as their selling points. The catch, though, is that you generally have to accept lower pre-tax returns in return for these tax advantages and it is often the case that these tax advantaged investments generate lower after-tax returns than conventional alternatives. An investment strategy built around minimizing taxes can lead to bad choices. Do you want an investment strategy that ensures that you pay not taxes next year? That's easy! Just buy non-dividend buying stocks that go down over the course of the year!! I was reminded of this simple proposition as I was considering the coming changes on capital gains taxes, the one aspect of the tax law where we know what next year will bring. The long term capital gains tax rate, which was 15% for the last decade, will jump to 20% for all investors on January 1, 2013, and to 23.8% for those investors who have more than $200,000 in income; the additional 3.8% is the tax on investment income that was part of the Patient Protection & Affordable Care Act of 2010. Thus, if you have $100,000 in capital gains on a stock, selling it on December 31, 2012 will result in a $15,000 capital tax, but selling it later in 2013 will generate $20,000 ($23,800) in taxes. While my first reaction was that I should sell my big long-term (held > 1 year) winners this year and save on taxes, I had to caution myself to go slow, since the savings in capital gains taxes have to be weighed against the value lost by selling early, if the holding in question is still undervalued. I ranked the investments in my portfolio, based upon absolute capital gains and then revalued each of the five stocks at the top of the list, using updated information. The three stocks that were still under valued (based on today's price and updated valuation) by more than 5% remained in my portfolio, whereas the two stocks that were under valued by less than 5% or were fairly valued (or over valued) were sold. If you don't have the time or the inclination to do a full fledged valuation, you can still ask yourself a question about your big winners: Would you buy the stock at today's prices? If the answer is yes, you should be hold back on selling the stock, even though capital gains taxes are going up next year. I know that next year will bring more of these trade offs. With dividend taxes, where there is more uncertainty, the worst case scenario is that they revert back to being taxed as ordinary income. For investors making over $250,000 in income, this could translate into a tax rates as high as 43.4% (assuming that the higher income tax rate reverts to 39.6% plus 3.8% in healthcare taxes). While my first reaction again is that if this scenario unfolds, I should avoid stocks that pay large dividends, I know that that reaction may not be a sensible one. After all, the prices on these stocks could fall to make their returns attractive enough that even with the higher taxes, they are good investments. When valuing companies, I believe it is best to keep personal taxes out of the analysis, since it is not your tax status or mine that is the determinant of the intrinsic value of a company. That value should be estimated from the perspective of the marginal investors in the company, i.e., investors who own large proportions of the stock and trade it, rather than your own. That is why we measure risk as perceived by those marginal investors (who we assume have diversified portfolios) and that is also why it is their perception of taxes that will determine intrinsic value. Thus, if the marginal investors in P&G and Coca Cola are pension funds (and thus unaffected by dividend tax law changes), it is possible that the intrinsic value of these companies may not change, even in the worst case scenario where the tax rates double on dividends. For the last decade, I was able to skip this step as the tax rates on capital gains and dividends converged, but it is a step that I cannot ignore if the tax rates on dividends and capital gains diverge again. As investors look for ways to reduce the tax drag on their investments, they will be tempted by complex products that will claim to save them taxes. For some of the very wealthy, these products may make sense, but for the rest of us, they often create more costs than benefits. I may be simple minded when it comes to taxes but I think that the most effective tax management strategy for most investors is to have a long time horizon. 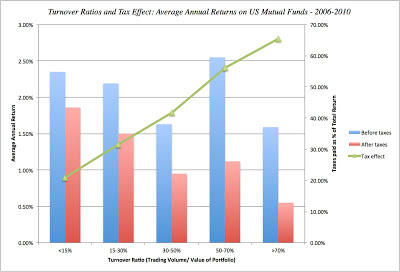 Investors with short time horizons generally pay more in taxes for two reasons: (1) their holding periods are too short to qualify their gains for long term capital gains, thus converting their price appreciation in ordinary income (with higher tax rates) and (2) the high turnover in their portfolios makes it impossible to have a cohesive tax strategy. While the returns on all funds were depressed by the poor market returns during this period, what is noteworthy is the tax drag (the different between pre-tax and post-tax returns) as a function of turnover ratios. The funds with the lowest turnover ratios (and the highest time horizons) had the lowest tax drag, whereas those fund that had short holding periods and high turnover ratios paid much more in taxes. At this point in the fiscal cliff debate, I am resigned to the fact that taxes will go up on January 1, 2013 and the only question is by how much. I have done all I can with my existing portfolio to reduce the impact of the tax law changes, but I have had to restrain myself from over reaching. It is possible that we will know what the tax code will look like before close of trading on December 31, 2012, and the market reaction to those changes will play out over the next few days. For my part, I am done with investing for the year and will spend tomorrow on more important concerns- friends, family and faith. Death and taxes may be unavoidable, but life is too short to be spent obsessing about either. So, have a happy new year and may it bring you health and happiness!! The year in review: Apple's universe? As the year winds to a close, I don't think that there can be much debate that this was Apple's year, for better or for worse. In my view, no company has dominated the financial news and the cultural landscape in any year as much as Apple did during 2012. Not only were Apple's earnings announcements greeted with mass hysteria, but Apple's products were bigger news than any celebrity on Hollywood. At the risk of adding to the heated discussion that accompanies almost any mention of the company, here is my attempt to pull together what happened to the company this year. January 2012: How much cash is too much cash? The year began with a great deal of breast beating, at least among some of the pundits & portfolio managers about how big Apple's cash balance was, as well as ill conceived arguments about why the cash was hurting Apple's stockholders. In my post on Apple's cash balance on January 19, 2012, I took on the argument that cash is a bad investment simply because it earns a low rate of return, and presented my thesis that a large cash balance can have a positive, neutral or a negative effect on assessed value, with the judgment depending upon how much you trust the management of the company holding the cash. With Apple's impeccable track record on both internal investments and stock price performance over the last decade, I argued that as an investor, I was comfortable with the company holding my cash for me and that the market was not punishing Apple for accumulating cash. In a later post on trapped cash in August 2012, I took note of the fact that a significant portion of Apple's cash was trapped in foreign markets and that returning the cash to the US would generate a significant tax bill. 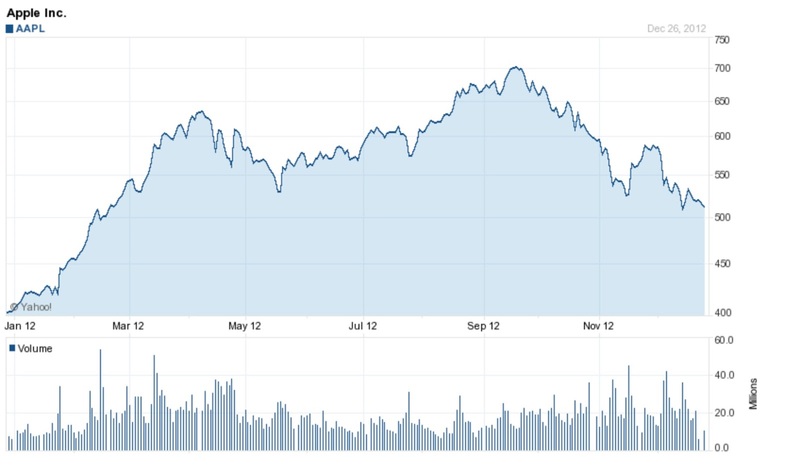 March 2012: Dividends or Buybacks? By March 2012, Apple's cash balance was approaching $100 billion, creating a second round of debate about whether it should return the cash to its stockholders. Rather than leave well enough alone, Apple opened the door to much greater pressure to do something with the cash, when Tim Cook, its CEO, conceded that Apple had more "cash than we need to run the company". Once that admission was made, I argued in a post on March 1, 2012, that Apple had no choice but to take action and return cash to its stockholders. 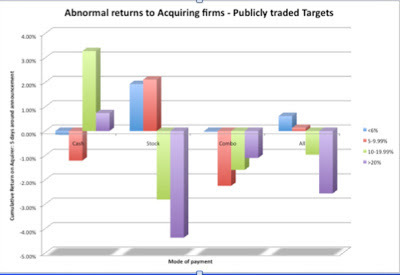 Looking at the choice between paying dividends and buying back stock, I argued that there were four considerations that came into play in making this decision: (1) whether urgent action was necessitated by the presence of acquirers or activist investors, (2) whether stockholders in the company were more motivated by dividends or capital gains in buying the stock, (3) what the tax consequences to investors were from receiving dividends/capital gains and (4) whether the stock was under or over valued. By my assessment, Apple's market cap made it invulnerable to outside pressure, its existing stockholders had generated all their returns from price appreciation and the stock was under valued (my value per share was approximately $ 710). I argued for a stock buyback of roughly $60- $ 70 billion, with a cap set on the buyback price. Apple did make a decision to return cash to its stockholders, but far less than I had argued for ($20 billion, rather than $60 billion) with half as a regular cash dividend. In a post on April 3, 2012, I explained a personal decision that I had made to sell Apple and laid out my reasons, though they were still misunderstood. After explaining how much I loved the company and how grateful I was for the returns that the stock had made for me from my original investment in 1997, I also was categorical that at $600+ a share, I felt that the stock was still a good value (based upon my assessment of value at $710/share). However, there were two forces at play in my decision to abandon the stock. First, the stock's incredible ascent over the previous decade had made it a large portion of my personal portfolio, making my wealth vulnerable to swings in the stock. Second, the decision to pay dividends, in my view, opened the door to a new group of "dividend" stockholders investing in the stock, with very different expectations of what the company should do in the future than the "growth seeking" stockholders who already held the stock. If you added the "momentum" investors who had joined in the mix, drawn by the large market cap and price surge in the stock, you had an investor base that was at war with itself. Every news story and corporate action, I felt, would be scrutinized and found wanting by one or more of these groups, which, in turn, would lead to wild price swings that I could not afford in my portfolio. That post exposed me to a fair amount of backlash (including anonymous voice mails on my office phone) and the critique that I was being emotional and not staying true to my intrinsic value roots. While I have a thick skin, I did feel the urge to follow up with a post on April 6, 2012, where I pleaded guilty to both charges, by admitting that my original investment in Apple in 1997 was an emotional one (I felt sorry for the company) and arguing that being right on intrinsic value was only half of winning the investment game. In fact, this tension between intrinsic value and price became a theme that I returned to repeatedly, during the rest of the year. In late August, the world was agog (and I am not using hyperbole) with the coming of the iPhone 5. As I listened to my youngest (thirteen) tell me about every new rumored feature that the phone was going to have, I did my part by valuing the iPhone franchise in a post on August 29, 2012, based on five value drivers: (a) an after-tax operating margin of 21% on the product, (b) a 6% growth rate in the smartphone market, (c) a product life cycle of 2 years, (d) only 5% of iPhone users would switch to competitors, whereas 10% of competitors would switch to the iPhone and (e) a risk level commensurate with the top decile of US stocks. The resulting value for the franchise that I obtained was $ 307 billion. The iPhone franchise valuation did point to a danger that Apple investors need to be aware of. Since half or more of Apple's value comes from the iPhone, the short life cycle for the product will inevitably create an ebb and a flow to the stock, with each new version of the product being scrutinized for signs of slippage, just as the iPhone 5 has. The iPhone did launch and while it was the most successful smartphone launch in history, what happened in the weeks following provides an illustration of the power of expectations. The assumption that Apple could do no wrong had become such an entrenched part of investor beliefs that every misstep on the iPhone put under the microscope. In a post on October 9, 2012, on expectations, I noted the contrast in market reactions to Research in Motion reporting that revenues dropped by 31% (its stock price jumped 18%) and to Apple's mishandled free Map app (which was associated with a drop in Apple's market cap of $40 billion). December 2012: Blame the fiscal cliff? As the end of the year approached, Apple seemed to go into a tail spin, starting with a disappointing earnings report in November but with the price drop accelerating as the year end approached. Not surprisingly, analysts and pundits were looking for something or someone to blame and the fiscal cliff became a favored target. Apple's stock price was collapsing, they argued, because capital gains taxes would increase in January 2013 and investors in Apple were therefore booking their capital gains in 2012. While I have argued that stock prices would be negatively affected if we go off the fiscal cliff, I don't see it as the primary factor behind Apple's fall. While the initiation of dividends in March 2012 has increased the exposure of Apple's investors to the tax law changes coming in January 2013, large dividend paying companies such as Coca Cola and P&G should have seen much worse carnage than Apple did, if the fiscal cliff is to blame. Absolute versus Percent: When a company has a market capitalization of $500 billion and its stock price is $500, small percentage changes in the stock will translate into large absolute values. 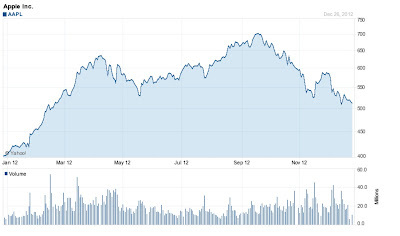 While that is stating the obvious, there is a psychological component that any investor in Apple has to deal with. A $25 drop in Apple's stock price will feel like a bigger drop than a $1.50 drop in Facebook's price, though both amount to roughly 5% of their respective prices. Put differently, Apple will feel more risky or volatile than it truly is, simply because investors are unused to $500 shares. Momentum shifts will continue to be the name of the game: Notwithstanding the 'psychological' effect of higher absolute price changes, the sudden shifts in momentum that we saw with Apple stock through 2012 will continue into 2013, as the different investor groups fight over the future direction of the company. Eventually, one or more of these disparate groups will abandon the company and move on to better targets, but that will not happen overnight. If you are an investor in Apple, be clear about what you see in the company and which group you attach yourself to. Don't get distracted by small details: I subscribed to a news site that aggregates opinion pieces about Apple as an investment and I was flabbergasted at how many of these pieces were based upon non-news. The process hit a climax, for me, when a unsourced blog post/news story/tweet that there was only one person outside the Apple Shanghai store when the iPhone 5 was introduced there caused the stock to lose $15 billion in market value. Much of what you will read about Apple (the size of the iPad mini screen, whether the Google maps app is better than the Apple Maps app, when the next iPhone is coming out) matters little in the big picture. Focus on Apple's value and its value drivers: The drivers of Apple's value are not difficult to decipher and I have attempted to make them transparent in my updated valuation of Apple. If you download the spreadsheet, you will note that my estimate of the value per share has dropped to $609 per share (from my March 2012 estimate of $710/share). While my revenue and margin numbers (the growth rate in revenues is lower, but the dollar revenues over time are similar) in the new valuation are very close to my March 2012 estimates, I have reassessed the cost of capital to reflect Apple's increasing dependence on Asia for future growth: that growth will come with higher risk (which shows up as a higher risk premium). I have also been conservative in assuming that the trapped cash will be subject to an immediate tax penalty of about $18.4 billion (when, in fact, it will be paid over a long period of time or perhaps not at all). If you are investing in Apple stock, you should make your own assessment of the company rather than trust mine (or anyone else's). Ignore the experts/analysts: During the last year, equity research analysts collectively have never been ahead of the curve on Apple's share price. Every increase in the stock price seems to lead analysts to increase their estimated value for the stock and every drop precipitates a drop in assessed values. So, ignore the buy, the sell and the hold recommendations from analysts, since they are agents of momentum rather than oracles of change. Bottom line: At $500/share, in my view, Apple is under valued and I believe that my assessment of value is a sober one, with little built in value added from future game changers. Apple reinvented the personal music player business (with the iPod), inspired the smart phone business (with the iPhone), created the tablet business (with the iPad), reconfigured the entertainment retail business (with iTunes and the Apple stores) and there is no reason why it cannot change other businesses and generate additional value for its investors. I am still nervous about my fellow travelers in this stock and how they may cause the price to deviate from value, but I am more sanguine than I was in April for two reasons. First, many of these investors are fickle and I would not be surprised to see the same momentum investors, who jumped on the bandwagon when the stock was going up, abandon it now. Second, l can live with the price noise if Apple were a smaller portion of my portfolio and I can make that choice. So, I have a buy limit order for Apple at $500 and I may or may not be an Apple stockholder this new year, depending on what the stock does in the next two days. I am okay either way! By now, it should be no secret that I am not a fan of acquisition-driven growth. I have argued in my previous posts that acquirers often pay too much, that many acquisitions are driven by CEO egos and overconfidence, that M&A bankers are too conflicted to give unbiased advise, that accretive deals can be value-destructive and that the presence or impairment of goodwill provides no useful information to investors. Am I being too negative in my portrayal? Possibly. After all, there are companies have grown successfully with acquisitions, at least over some periods. In constructing a value-creating acquisition strategy, it is worth looking at what these successful acquirers share in common. While acquisitions in the aggregate, and on average, have not been good news for acquirers, there are some subsets of acquisitions where acquiring company stockholders do much better. a. Small versus Large acquisitions: Acquiring smaller companies seems to provide much better odds of success than mergers of equals. 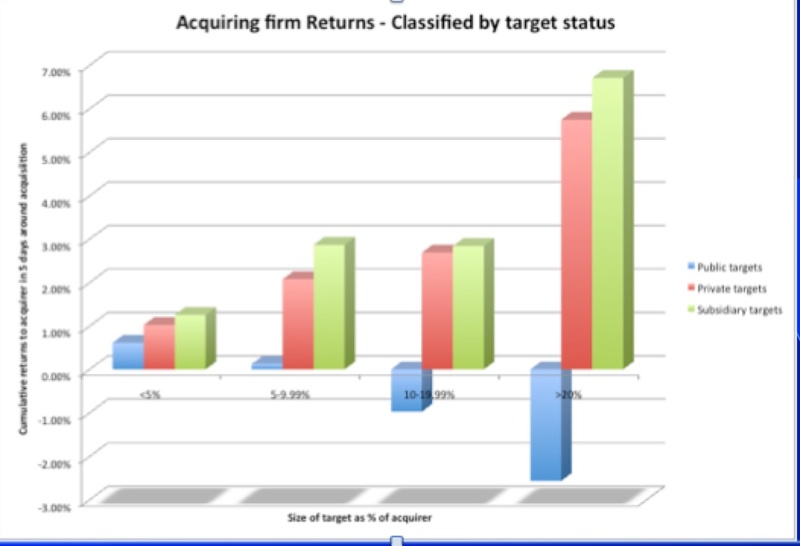 In the graph below, for instance, take a look at the returns to acquirers around acquisition announcements of targets, with the targets classified based upon their size in market cap terms, relative to the acquiring company. Markets are much more welcoming of small deals than big ones, justifiably wary of the integration costs and culture clashes that mergers of equal inevitably bring. 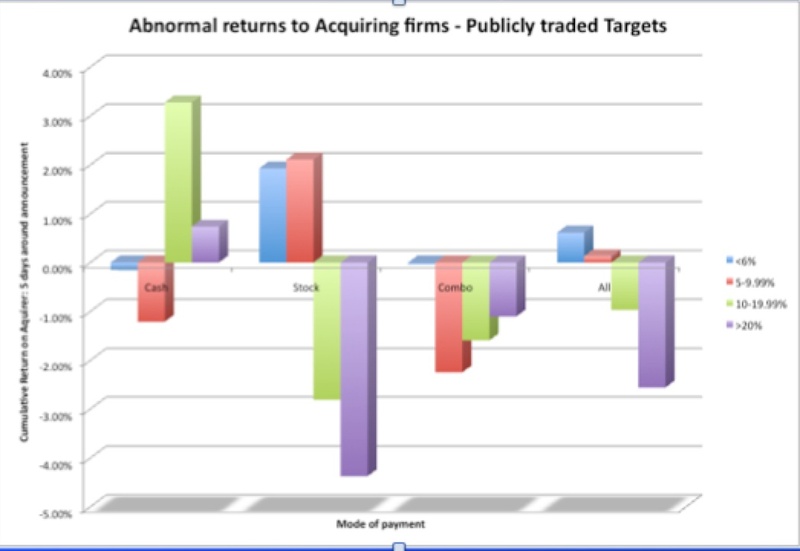 Note that the biggest successes are with target firms that are small, with market caps, less than 6% of the acquiring firm's market cap and returns get progressively worse as target firm size increases. 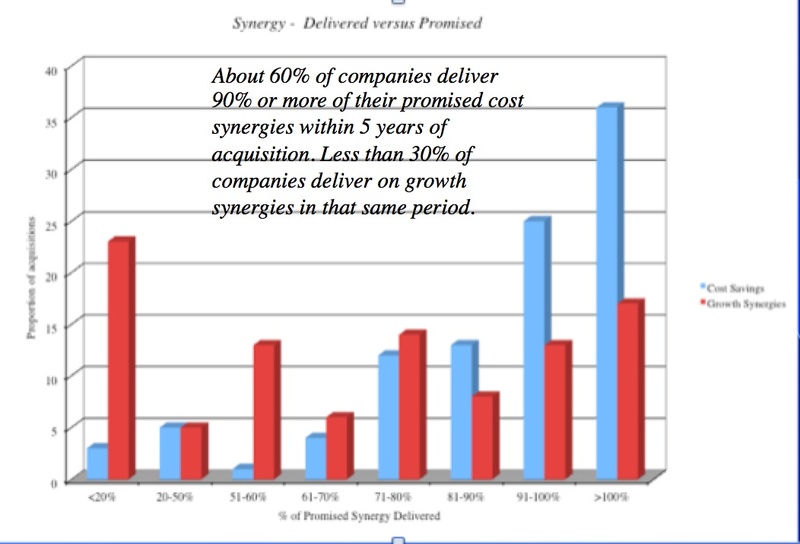 d. Cost synergies versus growth synergies: While it is good to be skeptical about promised synergies in acquisitions, companies seems to be much better at delivering cost synergies than growth synergies, as evidenced in the figure below. 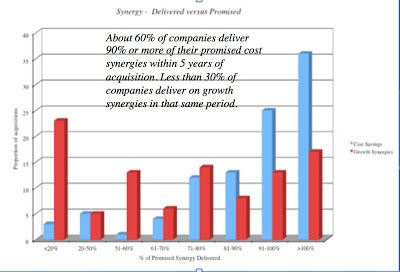 This phenomenon may reflect the fact that cost synergies are easier to plan for and deliver than amorphous growth synergies. Subtract the value of the target firm (with control premium) + value of the bidding firm (pre-acquisition). This is the value of the synergy. Investment Policy: Higher returns on projects and divesting unproductive projects. Dividend Policy: Return unused cash, especially if you are punished for it. Value of control = Target company value with optimal management - Status quo target company value from step 1. Each of these steps will require estimates and forecasts, but that is true for any investment. In fact, I would wager that many companies spend far more time making these assessments with small capital budgeting projects than they do with multi-billion dollar acquisitions. Managers will also claim that synergy is too qualitative and fuzzy to value, which would be fine if they were paying with qualitative dollars, but they are not. If you are interested, I do have more to say in my papers on the value of control and the value of synergy. You can also download the spreadsheets that I have to value control and synergy. Just because you have valued control and synergy in a merger does not mean that you should offer to pay that amount as a premium. If you do, target company stockholders walk away with the spoils of your “hard” work (in delivering control and synergy value) and your stockholders get nothing. Thus, a key step in acquisition is negotiating for a fair share of both the control and synergy values. That fair share will depend upon how integral the acquiring company is to generating these additional values; the more important the role of the acquirer, the greater the share of the premium it should demand. In fact, if bankers are true deal makers, this is where they should earn their fees. While many acquirers seem to view getting the deal done as the climax of the process, it is really the beginning of a long (and often tricky) process of integration. Good acquirers not only have clear plans for what they will do after the acquisition but they also set aside the resources (people, funds) to put those plans into operation. When mergers work, it is almost never by accident. The KPMG surveys of global mergers over the years have emphasized this planning and post-deal integration as a key component to deal success. If you want acquisitions to deliver value, you have to hold everyone in the process accountable. I would start with the managers in the acquiring firm but I would also include the bankers and consultants to the acquiring company. In particular, I think that management compensation and deal fees should have clawback provisions that are conditioned on the performance of the merged firm (in stock prices and profitability). If being tagged a loser delivers a 65% differential return over being tagged a winner, as a stockholder, I will take the loser tag. Creating value with an acquisition-based growth strategy is difficult to do, but not impossible. It requires discipline, planning and follow through, and few companies seem to have the capacity to deliver. There is no asset on a company’s balance sheet that wreaks more havoc on valuation and good sense than goodwill. The first problem with goodwill is that it sounds good, and when something sounds good, people feel the urge to pay for it. The second problem is that, notwithstanding claims to the contrary, it is not an asset but a plug variable that measures everything and nothing at the same time. To understand the treatment of goodwill in GAAP, it is worth taking a quick look at how acquisitions have been accounted for over time, at least in the United States. Until a decade ago, companies that acquired other companies could pick one of two approaches to “account” for the acquisition. In the first, termed pooling, the acquiring firm was allowed to incorporate just the book value of the target firm’s assets into its balance sheet, and essentially ignore or hide the premium paid over this book value. Thus, there was no goodwill on the balance sheet, but to qualify for pooling, the acquiring firm was required to jump through hoops (some of which were very expensive); for instance, only acquisitions financed entirely with stock qualified for pooling. 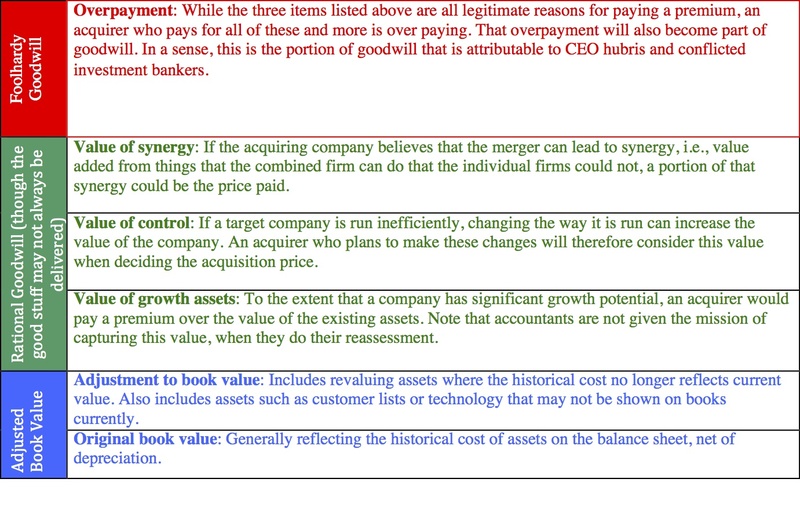 In the second, purchase accounting, the acquiring firm had to incorporate the market value of what it paid for the target firm on its balance sheet, and to show the difference between the market value and the book value as “goodwill” on its balance sheet. Under this old system, goodwill was amortized over a fixed period not to exceed 40 years, though this amortization was not tax deductible (at least in the United States). In spite of the fact that goodwill was a purely accounting variable and that its “non tax deductibility” made it irrelevant for cash flows, the fear of the earnings hit from amortization led companies to go through contortions (and to pay more) to qualify for pooling. AT&T, for instance, paid an additional $325 million when it bought NCR, to qualify for pooling, making an awful deal even worse. The prevalence of two different acquisition accounting systems also made it difficult to compare the balance sheet numbers for acquisitive companies that used purchase as opposed to pooling. Finally, amortizing goodwill over 40 years for all acquirers essentially resulted in both good and bad acquisitions being treated the same way for accounting purposes. To remedy these problems, the accounting rules were changed on June 30, 2001, with four key modifications. First, pooling was disallowed and all firms were required to use purchase accounting. Second, accounting rules were changed to give accountants more discretion, albeit within strict limits, to do a reassessment of the value of a target firm’s existing assets at the time of the acquisition. To the extent that a target firm had assets on its books that were recorded at below (or above) their “fair” value today, this accounting adjustment could lead to an adjusted book value (which is different from the actual book value). In addition, accountants were also allowed some leeway to bring in the values of “intangible assets” such as customer lists and technology patents into the book value of the target firm. Third, the goodwill was then computed to be the difference between the market value paid for the target company and the “adjusted” book value. Finally, rather than amortize this goodwill over 40 years, accountants were required to revalue the acquired company at regular intervals and impair the goodwill, if they felt that the target company had declined in value. While these changes made sense at an intuitive level, there are two things worth emphasizing about them. First, for better or worse, it has been a lucrative jobs program for accountants & appraisers, since their services are now required both at the time of the acquisition (to reappraise the value of the existing assets) and each period thereafter (to assess target company values). Second, as is the case with most accounting rules, the rules have obscured the principles of what the changes were meant to accomplish: create more transparency for investors about acquisition costs and more accountability for bad acquisitions. So, what does goodwill measure? 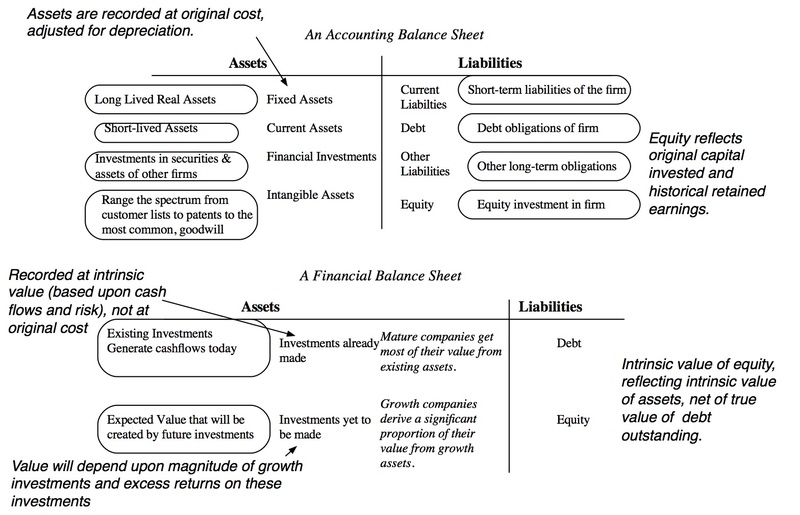 The balance sheet to the top is a conventional accounting balance sheet, with book values recorded based on what was originally paid for the existing assets, net of depreciation and debt & equity, reflecting the company’s history. 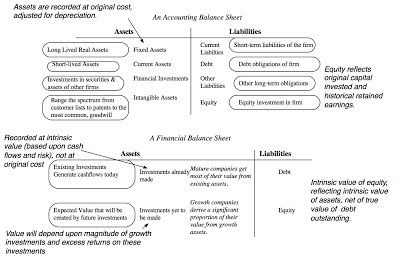 The balance sheet at the bottom is a intrinsic value balance sheet, with assets broken down into investments already made and growth investments (based upon expectations for the future). Thus, accounting goodwill is composed of both goodwill that has a rational basis (a fair value of growth assets, control, synergy) and goodwill that is built on sand. Why should you care? As a stockholder in the acquiring firm, you first want to separate out overpayment from the remaining reasons, since it is an immediate transfer of your wealth to the target company. You could, of course, wait for accountants to impair this portion of the goodwill but it not only happens too late to help investors, but it may also reflect unexpected disappointments on control, synergy and growth assets. I have a simple proposal that I know has zero chance of being adopted that may give investors at least a heads up, with acquiring companies. At the time of the acquisition, I noted in an earlier post that the acquiring company’s stock price drops in about 55% of acquisitions. If you accept the argument that this is the market’s collective judgment of how much was overpaid, why not break goodwill down into two components: the “market correction” can be called foolhardy goodwill and the rest can be rational goodwill. Thus, if a company pays $12 billion for a company with an adjusted book value of $ 4 billion, and sees its market cap drop by $ 3 billion on the announcement, you should see $ 3 billion in foolhardy goodwill and $ 5 billion in rational goodwill on its balance sheet. While both types of goodwill may turn out to be wrong, in hindsight, and may need to be impaired, I would argue that firms (their top managers and bankers) should be held much more accountable for failures on the former, because they chose to do the acquisition in the face of investor opposition. The presence of goodwill on the balance sheets of acquiring firms make it difficult to compare these firms to those that don't do acquisitions, because it exposes the inconsistency in accounting rules on the treatment of growth assets. A growth firm that grows entirely through internal investments will not show its growth assets on its balance sheet, until it makes those investments. If that growth firm is acquired by another firm, the goodwill that shows up on the company's balance sheets will include growth assets. Investors therefore have to wrestle with what to do about goodwill in both relative and DCF valuation: (a) If you use earnings multiples (PE, for instance) or book value multiples (Price to Book, EV to Invested Capital), comparing acquisitive firms to non-acquisitive firms can be skewed by the presence of goodwill. Since goodwill inflates the book values (of both equity and invested capital), acquisitive companies can look cheap on both price to book and EV to invested capital measures. 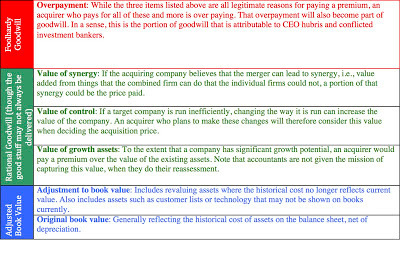 Analysts and investors often respond by using only "tangible" book value, where goodwill is removed from the equation. (b) In discounted cash flow valuation, a key ingredient that determines value is return on equity (or return on invested capital) and both can be pushed down for acquisitive firms, if goodwill is treated as part of book capital. Analysts again respond by eliminating goodwill from book value and invested capital for accounting return measures. That may tilt the scales too far in the other direction, because it gives acquiring companies a free pass on acquisitions and makes them look better than they really are in terms on returns on invested capital. I would argue for an intermediate solution, where the foolhardy goodwill (see above) is left in invested capital and the control/synergy portions are phased in over a 3-5 year period. Firms that consistently over pay for acquisitions or fail to deliver on synergy or control will therefore be assigned lower returns on invested capital and lower value. In summary, then, the new rules on goodwill have not reduced the propensity of acquirers to overpay for target firms, have not made their financial statements more informative, and might have made it more difficult for investors to value serial acquirers. So, would it not make more sense to move back to a simpler, automated system for reporting on acquisitions, with less accounting judgment and more reporting of facts? Analysts, investors and journalists who follow stocks have an obsessive focus on earnings per share, what it is now and what it will be in the future, as can be seen in the earnings announcement game every that takes up so much of Wall Street’s time and resources. 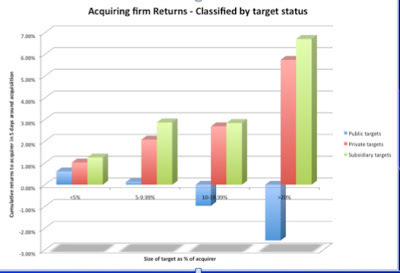 Not surprisingly, acquiring firms, considering new deals, put their accountants to work on what they believe is a central question, “Will the earnings per share for the company (acquirer) go up or down after the acquisition?” A deal that will result in higher earnings per share, post-deal, is classified as accretive, whereas one that will cause a drop in earnings per share is viewed as dilutive. 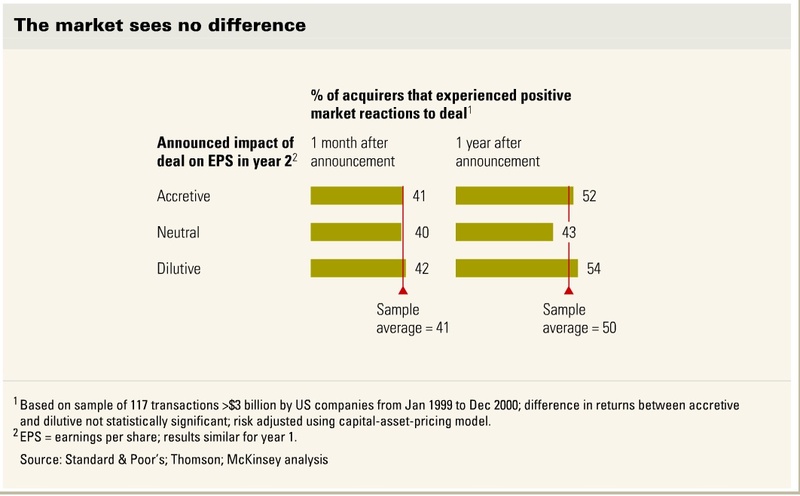 What are the relative PE ratios of the acquiring/target firms? In a share swap, where the acquiring firm’s shares are swapped for the target firm shares, the combined company’s earnings per share will increase (be accretive) only if the PE ratio of the acquiring firm is greater than the PE ratio for the target firm. It will be dilutive, if the reverse is true. How will the deal be financed? If a deal is funded with cash on hand or by issuing new debt, the deal will be accretive, if the company being acquired is profitable and is generating a high enough expected income to cover the lost interest income (if cash is used) or the expected interest expenses (if debt is used). If you are interested, you can download a simple spreadsheet that works out whether a deal will be accretive or dilutive to the acquiring company. If you are buying a company with a lower PE ratio than yours, there is usually a good reason why that company has the lower PE. It could be that the firm is riskier than average, has lower or no growth or is in a business with sub-standard returns. If any or all of these reasons hold, acquiring this company will bring those problems into the combined company and cause the PE ratio for the combined company to fall. If that drop exceeds the increase in EPS, the stock price of the combined company will also fall, notwithstanding the accretive nature of the deal. If you are funding a deal with cash, the deal will almost always be accretive because the income you are generating from cash (especially at today’s low interest rates) will generally be lower than the equity earnings you will get from the company that you are acquiring. But is that value enhancing? Not really. Replacing an investment that generates 1% riskless today with a risky investment that generates a 4% return will make investors in the company worse off, not better. If you are financing the deal with debt, the deal will be accretive if the equity earnings that you generate from the acquired company exceeds the interest expense. But here again, that is not a sufficient condition for value creation. You are contractually committed to make the interest expense, while the income you anticipate is “risky”. The basic tenets of the risk/reward trade off will require a much higher risky equity return than the interest rate on the debt you take on for the deal to be value creating. Using the same type of reasoning, you can see that it is possible for a dilutive deal to be value creating: the target firm may have higher growth/higher quality growth/lower risk than you do and acquiring it may push up the combined firm’s PE and/or there may be enough growth in the firm that even though the current earnings don’t cover your interest expenses/foregone interest income, the future earnings will comfortably. It is therefore entirely possible for an accretive deal to be value destroying and a dilutive deal to be value increasing. 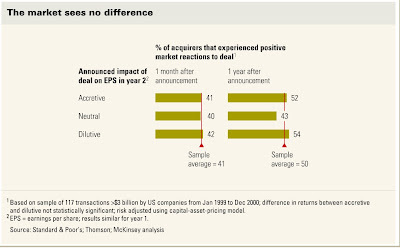 Note that at least in this short sample period, there is no evidence that markets reward accretive deals and punish dilutive deals. Thus, Leo Apotheker’s defense, offered two days after HP bought Autonomy, that “Autonomy will be, on Day 1, accretive to HP” would have rung hollow, even without the benefit of hindsight. I, for one, think that it is time that we consigned this dilutive/accretive analysis to where it belongs: the dustbin. It is not only truly useless in assessing the quality of deals, but worse, it allows companies to justify (at least to themselves) some really bad deals. HP is one of a multitude of companies that has overpaid on acquisitions, and like those other companies, it cannot claim that it lacked outside advice and guidance. In fact, HP paid $30.1 million in advisory fees to Perella Weinberg and Barclay’s Capital for guidance on how much to pay for Autonomy and whether the deal made sense. So why did they not spot the accounting manipulation or recognize that synergy would be elusive? In general, why, if acquiring firms pay so much for "expert" advice, do so many deals go bad? Conflicting roles: The answer can be seen in an imperfect analogy. Asking an investment banker whether a deal makes sense is analogous to asking a plastic surgeon whether there is anything wrong with your face. After all, if either party says “No”, they have no business to transact and no revenues to generate. Allowing the dealmaker (the investment banker) to also be the deal analyst (provide advice on whether the deal is a good deal) is a recipe for bad deals and we have no shortage of those. The solution is simple in the abstract but transitioning to it may be difficult. The deal making has to be separated from the deal analysis. Put differently, investment bankers should do what they do best, which is to manage the mechanics of the deal, and be paid for the service. There should be a third party, with absolutely no stake in the deal's success or failure, whose job it is to assess the deal to see if it makes sense, with compensation provided just for that service. Why has this common sense change not happened yet? First, as I noted in my last post, many acquiring companies want affirmation of decisions that they have already made (to acquire), rather than good advice. Second, the same entity (say, Goldman Sachs or Morgan Stanley) cannot slip back and forth between being a deal maker on one deal and a deal analyst on another, since there will be a shared and collusive interest then in shirking the deal analyst role. You would need credible entities whose primary business is valuation/appraisal and not deal making. The deal table: In many businesses, companies measure their success based upon market share and revenues. M&A bankers are no different and their success is often measured by where they fall in the deal table rankings. 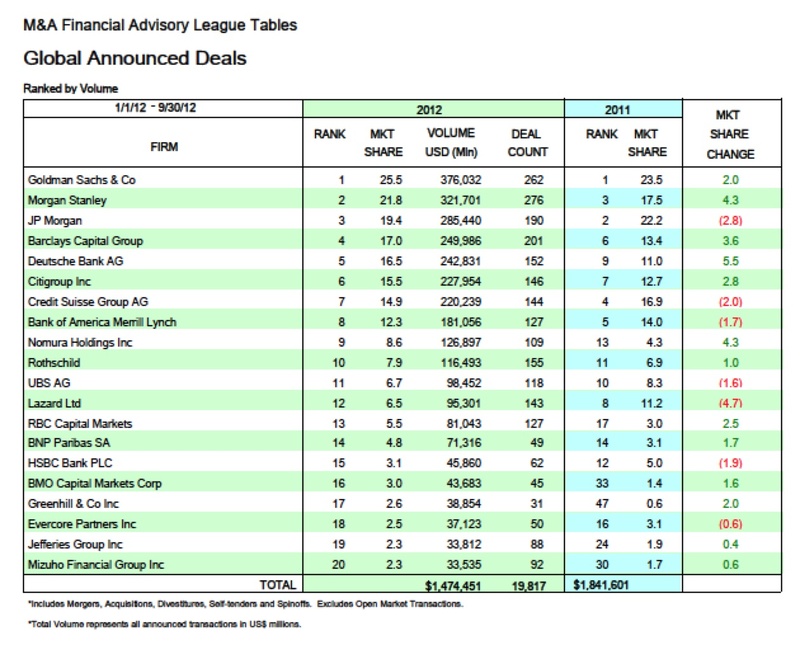 Here, for instance, is the latest deal table from Bloomberg, listing the top bankers for M&A globally, in 2011 and 2012. Note that the rankings are based upon the dollar value of deals done, and that there are no extra columns for good deals and bad deals. Consequently, a banker who does a $11 billion bad deal will be ranked more highly than one who does a $4 billion good deal. There are three implications that follow. When a big deal surfaces, bankers line up to be part of that deal, willing to bear almost any cost to get involved. The bigger the deal, the worse the advice you are likely to get; the conflict of interest that we mentioned earlier gets magnified as the deal gets larger. Individual bankers will be judged on their capacity to get deals done and not on the quality of their deal advice or valuation expertise. Thus, it is not surprising that the biggest stars in the M&A firmament are the dealmakers. In fact, it is interesting that Perella Weinberg is listed as one of HP”s advisors on the Autonomy deal. Joe Perella, co-founder of the firm has a long history in the acquisition business that goes back almost four decades to his position as co-head of M&A at First Boston in the 1970s. He left the firm, with the other co-hear of the First Boston M&A team, (Bid 'em up) Bruce Wasserstein, to create Wasserstein Perella, a lead player in the some of the biggest acquisitions of the 1980s. He returned to head M&A at Morgan Stanley for a few years before leaving again to found Perella Weinberg. Through all the years, it seems to me that the singular skill that he possesses is not his capacity to value target companies but that he can get any deal done. So what can we do to change this focus on deal making? We do have to begin by changing the way we compensate bankers in deals but we also have to follow up on deals. 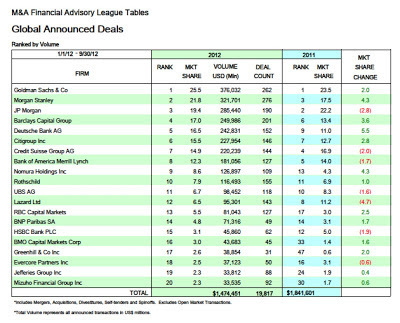 I would like to see some entity generate deal tables that track the largest deals from five years ago and report how much those deals have made (or lost) for stockholders in the acquiring firms. It would be interesting to see the list of the top 10 bankers in terms of value creating and value destructive deals. Compensation: The third factor that contributes to the deterioration of deal advice is the way in which the deal advisors get compensated for their services. In most deals, the deal advisors get paid for getting the deal done and there is no accountability for deal performance. Neither Perella Weinberg nor Barclay’s Capital will have to return any of the advisory fees that they received for the HP/Autonomy deal, even though the advice that was offered was atrocious. I think that there is a solution, even within the existing system. Rather than tie the entire fee to getting the deal done, a significant portion should be contingent on post-merger performance. Thus, if the acquiring firm’s stock price or profitability fails to beat the peer group’s stock price performance or profitability in the years (two, three or five) that follow, the bankers will either not get a large portion of their fee or be forced to return a proportion of the fees that they have already been paid. Bankers will complain that this puts them at the mercy of macroeconomic shifts and mismanagement of the post-merger integration, but those are variables that they should be considering when assessing whether a deal should get done. In closing, though, acquiring firms are quick to blame bankers for bad advice. As I noted in my last post, I think that the ultimate blame has to lie with the top managers of the acquiring firms. No acquirer is ever forced to do an acquisition at the wrong price and if they chose to do so, they should be held responsible. 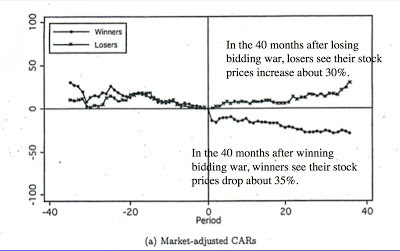 In my last post, I noted that acquisitions are more likely to destroy value for acquiring firm stockholders than to add value, and that there is little evidence that companies learn from history. That is puzzling, given the manpower, data power and model power that is brought into the acquisition process. How can all these smart people working with sophisticated models and updated data be so wrong so often? The answer I think lies in a simple fact: in most acquisitions, the decision to acquire is made first and the analysis follows, and all too often, the decision is not only made at the top of the organization, but at the very, very top by the CEO. That is not the way organizations are supposed to work. Big ideas, no matter who originates them, are supposed to be discussed honestly and openly, analyzed fully and then vetted by an independent, well informed board of directors to make sure that stockholder interests are being served. That may still happen in some organizations, but consider this alternate reality. In a moment of inspiration (insanity) or brilliance (lunacy), the CEO decides to do an acquisition of a target firm for strategic (empire-building) reasons. The managers around him or her, recognizing that the die has been cast, choose not to voice their opinions, get bulldozed when they do, or decide to join the CEO in pronouncing the acquisition a great idea. An investment banker is found to affirm that the deal is, in fact, a great deal and the rest as they say is history. Reminds you of this fairy tale, right? If you find this scenario to be absurd, start by taking a look at James Stewart's article on the HP/Autonomy deal and especially at the back story on how Leo Apotheker, HP's then CEO, pushed for the deal even as there were plenty of doubting voices (both within and without the firm), and how the board essentially went along with his wishes. Then, move on to take a look at these stories about Eisner's role in Disney's acquisition of Capital Cities in 1995 and Zuckerberg's role in Facebook's purchase of Instagram earlier this year to see how much head-strong CEOs can influence the acquisition process. Insider holdings in the companies that they manage: Rather than diversify and spread their risks by investing in other companies, over confident CEOs seem to double up and invest their wealth/income back into the companies that they manage. Press reports: Looking across financial news stories for mentions of the CEO in question, they looked for the words "confident" or "optimistic" in descriptions of the CEO opposed to words such as "cautious", "frugal" or "steady". If the former exceeded the latter, the CEO is classified as an over confident CEO, whereas if the latter dominated, the CEO was classified as a cautious CEO. 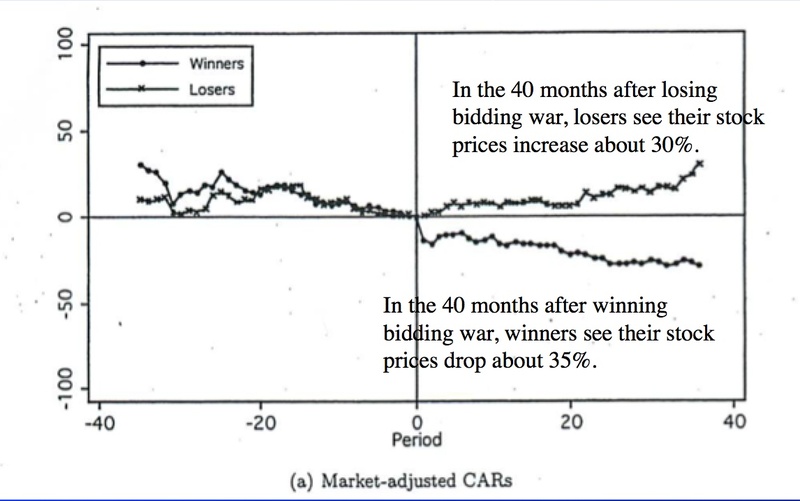 They then looked at a sample of 394 large US firms and found that over confident CEOs were 65% more likely to do acquisitions than cautious CEOs, though they were also less likely to draw on external financing; their over confidence led them to believe that the market was underpricing their stock and thus made them more reluctant to use stock in acquisitions. They were also more like to acquire just to diversify, and the market reaction to their acquisitions is more negative than to acquisitions by cautious CEOs. Can no one stop a headstrong CEO? There is a counterweight built into the system, the board of directors, and it can act as a restraint on a CEO embarking on a value-destructive path. Unfortunately, one common feature shared by value-destroying acquirers is a compliant board, that shirks its responsibility to protect shareholder interests. It is not surprising that it HP, which has had issues with corporate governance and board oversight, was the ill-fated acquirer of Autonomy. In summary, then, a headstrong, over confident CEO, combined with a compliant board creates a decision making process where there are no checks on hubris and large, value destroying actions often follow. If investors want to prevent their firms from embarking on deals like the HP/Autonomy deal, they need to pay attention to corporate governance, and not just at the surface level. After all, the board at HP met all the Sarbanes/Oxley requirements for a "good" board and may even have scored high on the corporate governance scores in 2010. The problem with corporate governance watchdogs, legislation and scores is that they are far too focused on what the board looks like and far too little on what it does. In my view, it matters little whether a board is small or large, whether it is filled with luminaries or unknowns, experts or novices and whether it meets the criteria for independence. It does matter whether the board acts as a check on the dreams and acts of imperial CEOs.